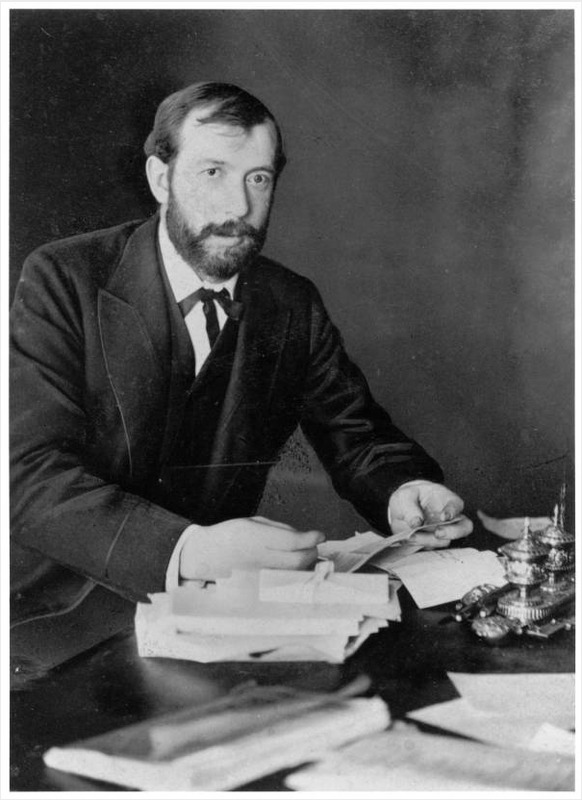 Scripps poses at his desk, ink staining his fingers, circa 1880s. Image source: W. Scripps as young newspaper publisher at desk, 1880s by unknown photographer is from the E.W. Scripps Papers at the Ohio University Libraries and is in the public domain. In 1878, Edward W. Scripps (1854-1926) borrowed $10,000 from his brothers to set off America's first information revolution - beginning with the launch of a newspaper in Cleveland aimed at an emerging - but yet unserved - mass audience of urban workers. "The Penny Press," named for its affordable price, was clear, concise, and politically independent. It quickly became the model for the nation's first mass medium. In the early 1920s, Scripps added "Howard" to the company's operating name to recognize the growing contribution of Roy W. Howard, an aggressive young newsman who rose to become president and chairman of the concern. First home of the Cleveland Press on Frankfort Street, Cleveland, Ohio. Paper originally began in 1878 as Penny Press. Image source: Cleveland Press, first home, Frankfort Steet, Cleveland, Ohio, ca. 1878 by unknown photographer is from the E.W. Scripps Papers at the Ohio University Libraries and is in the public domain. A few years later, Scripps launched United Press as a competitor to the Associated Press (AP). In 1958, United Press merged with Hearst's International News Service, and became United Press International (UPI). The E. W. Scripps Company next expanded to owning television stations and went public in 1988 on the New York Stock Exchange. Scripps also nurtured a syndicated features service, initially built around the writing of his sister, into a licensing and syndication company that thrives today as "United Media." The next venue for expansion proved to be cable television, with the launch of Home & Garden Television in 1994. E. W. Scripps then developed the Do It Yourself channel in 1999, and Fine Living in 2002. E.W. Scripps also owns Summit American Television, which consists of 5 television stations, including Shop At Home, the fourth-largest home shopping network. The E. W. Scripps Company is now the ninth-largest newspaper publisher in the United States, with 21 daily newspapers and a combined total circulation of 1.2 million. Newspapers account for 50 percent of revenue, while its ten television stations (including the Food Network and HGTV) make up another 20 percent. The E.W. Scripps Company is a diverse media concern with interests in newspaper publishing, broadcast television, national television networks and interactive media. Scripps operates 21 daily newspapers, 10 broadcast TV stations and three cable television networks, with plans to launch a fourth. Scripps national television network brands include Home & Garden Television, Food Network, Do It Yourself and Fine Living, launched in 2002. The company also operates Scripps Howard News Service, United Media, the worldwide licensing and syndication home of PEANUTS and DILBERT, and 31 Web sites, including hgtv.com, foodtv.com, diynet.com and comics.com. Scripps often ran his business from his homes. One legacy of Edward W. Scripps also continues in the form of Science Service, a nonprofit science education and publishing organization founded by Scripps more than 80 years ago. Founded in 1921, Science Service advances public understanding and appreciation of science around the globe through publications and educational programs. Science Service has encouraged students, parents, teachers, and communities to explore the vast world of science. Science Service is the parent of the Intel International Science and Engineering Fair and the weekly Science News magazine. Through publications and programs, science fairs and scholarship competitions, Science Service helps young people utilize and strengthen their knowledge in science, math, and engineering. Many credit these experiences as a decisive factor in choosing a scientific career. A member of the Ohio Academy of Science, the late David Dietz (1897-1984) was the first science editor on an American newspaper (the Cleveland Press in 1921) and one of the first board members of Science Service. Sketch of Cincinnati Post drawn by Peter J. Schaefer, and appearing on September 26, 1885 in The Graphic. 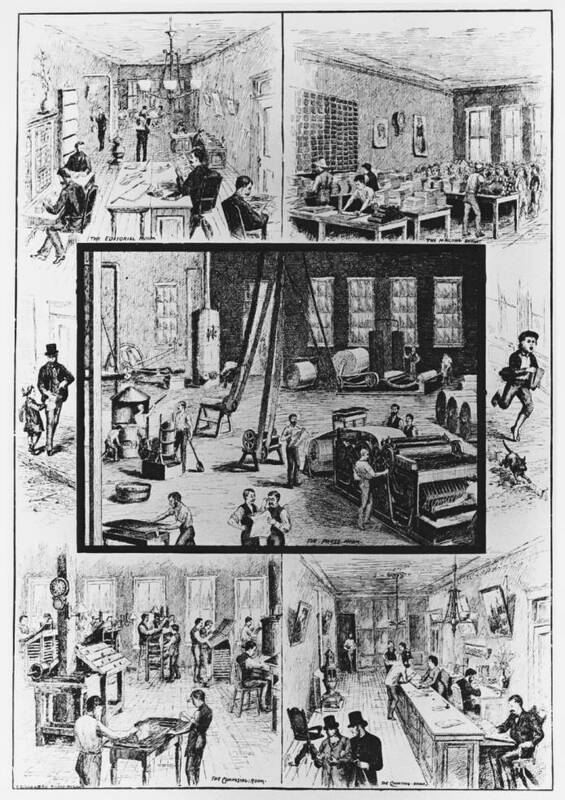 Image source: Cincinnati Post sketch from The Graphic, 1885 by Peter J. Schaefer is from the E.W. Scripps Papers at the Ohio University Libraries and is in the public domain.